Evil, Antic And Modern, 'The Merry Spinster' Puts A Dark Spin On Fairy Tales Mallory Ortberg's hyperliterate new story collection turns familiar fairy tales inside out to comment on gender, relationships and the way people manipulate each other. "I am authorized to perform acts of justice, power, and retribution, to deliver messages of comfort and healing," begins the angel that wrestled with Jacob in Mallory Ortberg's adaptation of the Biblical story, "Fear Not: An Incident Log." "I am also cleared to open wombs ... feed prophets in the form of either raven or dove, open seals, pour out bowls of judgment, and blow all twelve of the lesser trumpets. I am not authorized to take communion or to deal out death. All the deaths listed in my incident history have been accidents; you can check the tickets." This joyously weird melding of Old Testament and IT incident report is typical of Ortberg's work, which appeared on the late, lamented feminist website the Toast and more mildly now in Slate's Dear Prudence column. 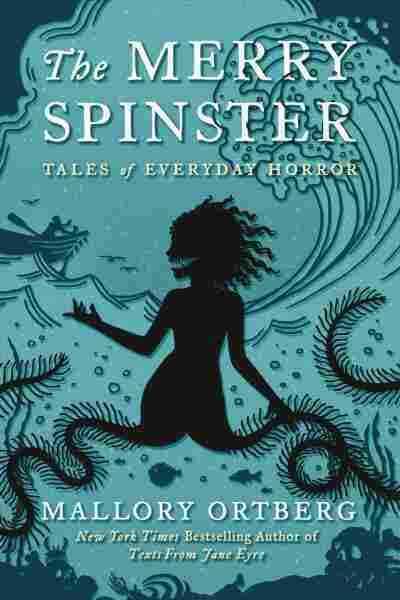 The stories in The Merry Spinster, some of which appeared in the Toast series "Children's Stories Made Horrific," explore the accidental hilarity of ancient texts, the fraying edges of gender, and the crawly underside of fairy tales. Ortberg has none of the gory lushness of Angela Cartner, but something more evil, antic, and modern, not to mention hyperliterate. One passage from a dark riff on The Velveteen Rabbit begins with the Skin Horse telling the Rabbit how to become "Real:"
"When a child loves you for a long, long time — not just to play with — but really loves you, then you become Real." "Can you hurt something else, when you become Real?" "Can you take someone else's Real," he asked, "or are you stuck having to get it brand-new each time on your own?" The Skin Horse looked at the Rabbit then. "What I mean is," the Rabbit said carefully, and his voice was a crawling black thing across the floor, "if something else was already Real, could you take it from them, and keep it for yourself?" "The Rabbit" is a dark, delicious joy: a funny and genuinely eerie adaptation that quickly spirals into a parable about possession and what happens to love in a power asymmetry. Not every story has that wonderful, wicked pull, but the two or three that do manage to articulate some very real aspect of human relationships and dependency. When he loses a toy down a well in the woods, a frog volunteers to help, and then asks what the daughter will give him in return. "But I did not ask you to help me," he said, "so why should I promise you anything?" "You are sitting on my well," said the frog. "You are beautiful, and you are crying, and I saw you before anyone else did; that is almost the same thing as asking, or being asked, anyhow." The frog brushed its long, thumbless hand over his, and the man's youngest daughter had no answer for that." The frog extracts a partial and unwilling promise to "accept me as a companion, and let me sit next to you at your father's table, and eat from the plate you eat from, and drink from your cup, and sleep in your bed ..." And so the youngest daughter has to endure the frog's "lipless" kisses and breath like old coins. Each of these 11 stories asks something similar: What do we owe our friends, family, and strangers? And what is it fair to ask of them? Ortberg pins down the precise ways obligation is created and then abused, particularly when the victim is too young to understand they are being manipulated. Each of these 11 stories asks something similar: What do we owe our friends, family, and strangers? And what is it fair to ask of them? "The Frog's Princess" describes a quintessentially young female experience, but ties it to role (daughter), not gender — which feels curiously liberating, an assurance that the way women are treated is not due to any inherent gendered trait but to arbitrary casting. One of The Merry Spinster's sharpest delights is the way fairy tale roles — wife, princess, youngest daughter, husband, king — are all detached from gender, so we are able to see them more clearly as distinct tropes. A just-married couple asks each other who would rather be the wife. It's playful, but it's also immensely freeing: The accumulated weight of those roles could just be snapped off, as easily as the hair on a Lego person. Ortberg interrogates these roles without thrusting readers onstage. As a reader, it was a relief, for once, not to have to play the girl.